Hall of Fame season is upon us. I don’t know about you, but my views on the Hall of Fame have really evolved over time. When I was a kid, I thought of it as the final say in who the greatest players were. Then, I got jaded and stopped caring for a while. But now, I find that I want it to at least be consistent. I’m not to the point where I think it should just be a numbers exercise. I understand that there is historical context for players’ careers and accomplishments, and that sometimes numbers don’t tell the full story. But it does bother me when two players who are amazingly similar are met with wildly different results. Why, for instance, did Barry Larkin get in relatively quickly, while Alan Trammell had to wait for a special committee? I grew up a Reds fan, and even I know not much separates them (I think both deserve their spots in Cooperstown). This brings us to my current soap box: Scott Rolen. Rolen received only 10 percent of the Hall of Fame vote last year, and I genuinely don’t know why. In terms of WAR, the Hall of Fame voters generally seem to require a player to be right around 60. Rolen has a career 69.9 WAR at FanGraphs and 70.2 at Baseball-Reference. These are numbers that should push him easily into the Hall, especially given his reputation. Or, at least, I feel like they should. But I don’t know. It’s weird to see perception of a player morph. I was aware of Rolen throughout his entire career, and even though I only followed it closely once he came over to the Reds, I feel confident saying he was extremely well-regarded. He had injury issues, sure, but that hasn’t kept others out of the Hall (see Larkin, Barry). He was amazing at third and he could really hit, too. Which brings us to the rub: Third base. Third base is famously underrepresented in the Hall of Fame. Essentially, to get in playing third base, a player has to hit like a corner outfielder even though – historically – third basemen almost never have. It’s a bit odd, and, I think, a product of the narrative that third is a bat-first position, which it has never been. And like most things, all we can do is talk about it and encourage the people with votes to go look at the numbers and hopefully reevaluate their views on the position. Perhaps some further comparison would help. I wanted to pull a list of players who felt a lot like Rolen to me. Who provided similar value (great careers, but not obvious inner-circle Hall of Famers) and who are also fairly recent, placing them more or less in the same historical context and era of baseball as Rolen. 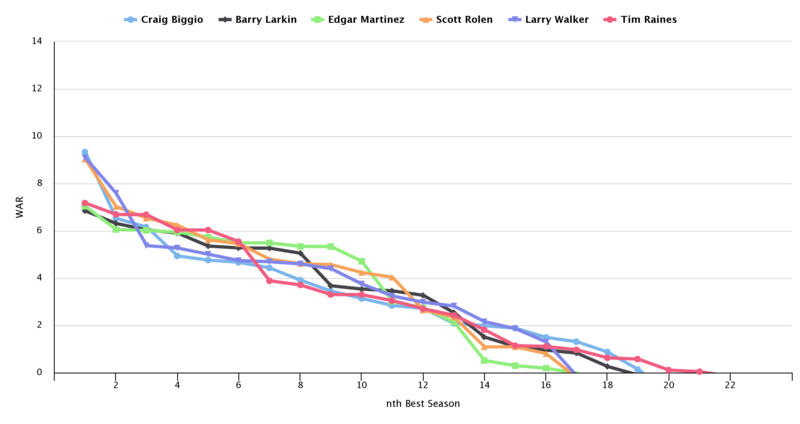 I used FanGraphs to compare the players. Let’s take a gander. What you see there looks like a mess, which is actually the point. 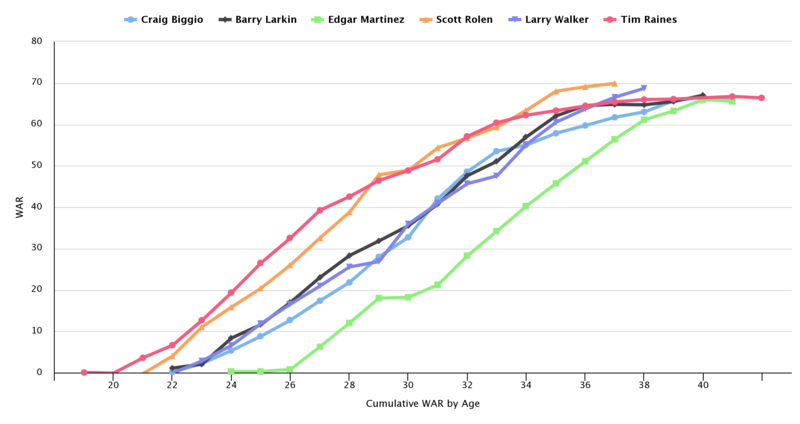 Scott Rolen, Tim Raines, Larry Walker, Barry Larkin, Craig Biggio, and Edgar Martinez all provided similar value and took similar career paths. Of course, they didn’t all arrive at that value the same way. Some, like Larkin, Rolen, and Biggio were helped by defense. Some did the slow fade, while others dealt with injury as their careers progressed. But looking at the graphs, it’s all very similar overall. And yet, these players have had wildly different results in the Hall of Fame voting. This is what bugs me. It would be one thing if some had just cleared the line, while others just missed it, but that hasn’t been what’s happened. Okay, sure, you say, but none of those other guys play third (except for Martinez early in his career). Fair enough. Third base is weird, as we’ve noted, but even compared to other Hall of Fame third basemen, Rolen stacks up pretty well. Rolen has a 122 wOBA+ for his career. That’s on par with Paul Moltior and Ron Santo. It’s better than Adrian Beltre and Brooks Robinson. If wOBA+ is too fancy, I can tell you he has a higher career OPS than Brooks Robinson, Paul Molitor, Adrian Beltre, and Ron Santo. He is also only two points behind George Brett and only three points behind Wade Boggs. And we haven’t even talked about defense. If we go by the numbers available, Rolen was one of the best ever. On a per-game basis, he was even better than Adrian Beltre (Beltre’s longer career puts him ahead in raw totals). He wasn’t better than Robinson with the glove, but no one was. But he was great with the glove AND he hit. 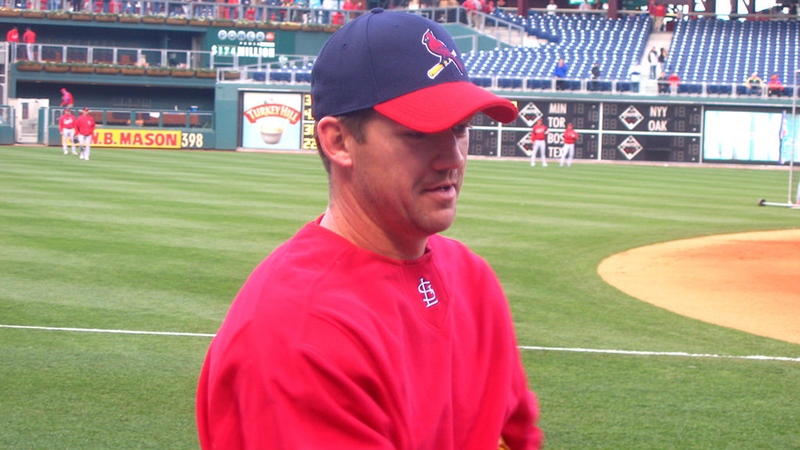 It is true that Rolen didn’t get as much playing time as would be ideal for a Hall of Famer. His shoulder injuries did real damage to his career. But I can also point you back to Martinez and Santo, who had careers of very similar length. 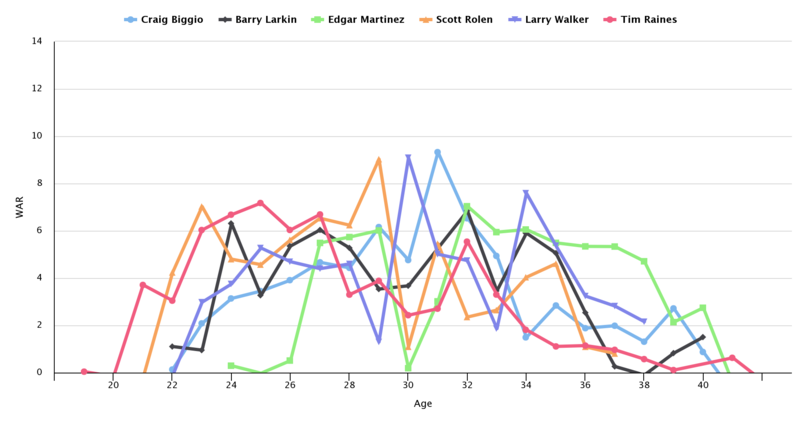 For all the relative brevity of his career, according to FanGraphs, he has the highest total WAR of any position player on the ballot not named Barry Bonds. His career and peak WAR totals are above average for a Hall of Fame third baseman according to Baseball-Reference, as is his JAWS rating (as Jay Jaffe just discussed on FanGraphs). He is also one of only nine players to post a nine WAR season at third (2004). The only one not in the Hall is Al Rosen, who had an abbreviated career. I understand that every single point I raise in Rolen’s favor can be met with a “Yes, but…” And that would be fine if it were a consistently applied standard. There are many recent inductees who come with the same caveats as Rolen, and yet he barely got a sniff from Hall voters last year. By the numbers and by the narrative during his career – by every way we have to measure him against his peers – he was every bit the equal of plenty of Hall of Famers. Slice the pie anyway you want, but odds are, you won’t be able to exclude Rolen without also excluding someone who is widely accepted to belong in the hall. All I’m asking for in the process of considering Rolen is consistency and a deep examination of the context. In the baseball world, Hall of Fame voting is about as serious as things get. So let’s use the established standards as a benchmark and measure players against those standards. If you do that, Rolen belongs. His career value, his peak numbers, his career offensive numbers, and his career defensive numbers when taken together make him, by any reasonable application of established standards, a Hall of Fame worthy player. Jason teaches high school English, writes fiction, runs a small writing program and writes about education and literature. He also writes for Redleg Nation and both writes and edits for The Hardball Times. Follow him on Twitter @JasonLinden, visit his website or email him here. I wonder what that 1997 NL rookie of the year voting looks like with today’s methods of evaluating players. Maybe Rolen still wins it over Matt Morris, but there is no way Rolen gets every single first place vote nowadays. Or maybe he does as he had the highest WAR and people would care more about his 3b defense nowadays.